This has always been one of the most frequently asked questions among dog guardians. They see their dog eating grass or chewing on plants — seemingly for no reason. Not surprisingly, dogs sometimes gag or even vomit the grass they have swallowed and then go right back to eating more grass! Other times the grass they swallow may pass in their stools undigested. Are they trying to make themselves vomit? Are they trying to make themselves pass something? Are they attempting to clear their intestinal tract of foreign objects or parasites? Why do dogs like grass? The eating of strange objects and material is called “pica.” Some people believe that dogs eat strange things to stimulate vomiting or diarrhea, but this is undermined by the fact that most dogs do not act ill before eating grass. Besides, most dogs that eat grass don’t vomit at all. Your dog may be bored — Dogs chew things frequently when they’re bored and need “something to do.” Be sure to provide plenty of enrichment and activity and even appropriate chewing options, like chew toys. Your dog's diet may be missing something — If you feed your dog home prepared diets, it is possible that they are missing a key nutrient; although, if you supplement the diet with veterinarian approved vitamins, it becomes improbable that they are lacking anything found in grass. Make sure your veterinarian is aware of your dog’s diet and see if he thinks anything could be missing. Dogs are truly omnivores; they can, and do, eat both meat and plant material. Wild or feral dogs, and dogs who hunt, often ingest the intestines of their prey along with the stomach contents — including plant material. 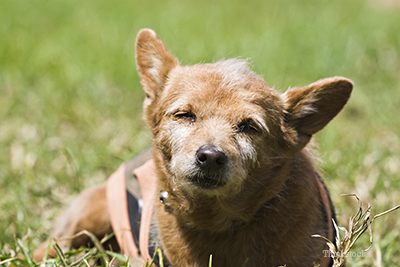 Occasionally grass, and particularly grass awns, can become lodged in the back of your dog’s throat or between his teeth. If your dog wretches after eating grass or paws at his mouth, check for lodged grass as a potential cause. Again, grass is a normal component of a dog’s diet, but some grass seed has been treated with chemicals for various reasons and should certainly be avoided. Yard sprays, such as weed control or fertilizers, can turn grass and plants toxic. If you don’t know for sure that an area is chemical free, don’t let your dog graze. Remember too that while grass is not itself toxic, some common weeds and ornamental plants are! Click here for more information on toxic plants. So long as grass is untreated, and you don’t allow it to become an obsessive behavior, it will do no harm. What can I safely substitute for grass? Assuming, as I do, that dogs simply like the taste of grass, look for something cool, fresh and textured. I have seen pet owners use fresh carrots, peeled celery and even lettuce. Find out which your dog likes. There is no evidence that eating grass is usually anything more than a behavioral concern, but because of the potential medical ramifications caused by toxins on grass you should, ideally, try to discourage it.